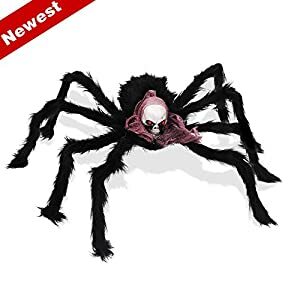 ☪ The Newest style halloween spider props ! Durable and reusable. ☪ Vividly spider with skull and red eyes which looks like real and scary halloween decorations at outdoor or indoor. ☪ All the legs of the spider inlcude iron wire but very light , can be bent randomly and not easy to break & fall off.